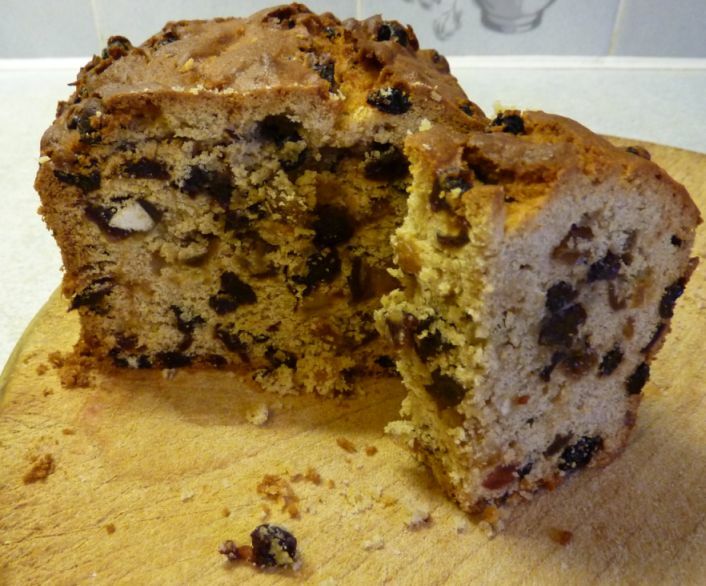 This is a rich and comforting fruit cake for the winter, not to be confused with the much darker and heavier traditional Christmas cake. It will happily share a slow oven with a casserole, such as beef and vegetable hot pot. You can vary the dried fruit as you please, depending on taste and availability. Grease a loaf tin about 8 inches by 4.5 inches by 3 inches (approx 20 cm by 11 cm by 7 cm). Line it with a strip of greased greaseproof paper. Halve the glace cherries (if using). Chop the apricots and dates (if using) into pieces about the size of a raisin. Melt the butter in a large mixing bowl. Beat in the sugar. Beat in the eggs and orange rind (if using). Stir in the flour, spices and chopped dried fruit. Mix well. Stir in a little milk, until the cake mixture is a soft dropping consistency (i.e., if you lift a spoonful of mixture out of the bowl and hold the spoon vertically, most of the cake mixture will drop off the spoon and fall back into the bowl). Put the cake mixture into the greased and lined loaf tin and level the top. Bake in a slow oven at about 150 C for about 1.5 hours, until set and a skewer inserted into the cake comes out clean (i.e. with at most one or two crumbs clinging to it, not coated in a layer of uncooked cake mixture). Cool for a few minutes in the tin, then turn the cake out of the tin and cool on a wire rack. The cake will keep in an airtight tin for a week or so, and freezes well. Constance - it will keep you going for a while if you make one just for yourself :-) Hope you enjoy it!